Don’t feel limited by a space that doesn’t have overhead wiring for a ceiling mounted light fixture. Get the look and feel with this inexpensive DIY lighting solution. Last week I revealed a home office makeover that I worked on with a local reader and friend, Vanessa. We transformed her space for around $500. Her office makeover encompassed a ton of simple DIY projects. One of the focal points in her space was a beautiful simplistic chandelier that hung above the desk. I’m going to show you in this step by step tutorial, how I created that DIY lighting feature. You might be surprised to learn that the lighting didn’t require any electrical work. Her office wasn’t wired for a ceiling mounted light fixture. To add a fixture it would have easily blown the budget, costing between $500-$600. This DIY light fixture is battery operated and we used a drum shade lampshade we found on clearance for only $5. To further sweeten this little lighting project, this chandelier comes with a remote. Step 1: Figure out the shape and design of your pendant and cut to size. I found a variety of wood pedestals and wood turns in my local craft store. You can get as creative as you’d like with this. I happened to pick a pedestal that I needed to cut down. 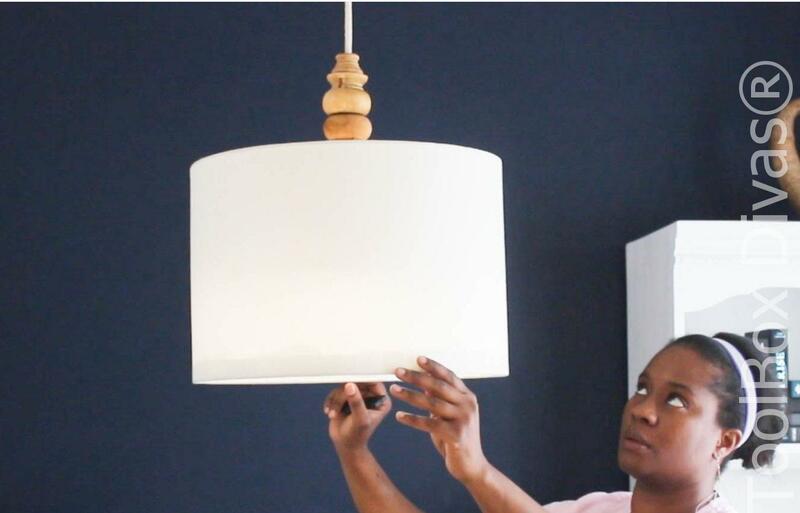 You can pick items that you can simply drill into and create the perfect pendant above the drum shade. This is a personal preference. But if you are cutting any pieces, make sure to securely clamp it down before cutting. Use a handsaw, not a mitersaw or anything powered. You want to cut this slowly and be careful. Step 2. Drill a hole down the center of the paint stirs and wood turns. Mark the center of the paint stirs and drill through the 3 stirs . Use a 3/8 drill bit to create the hole. . Create a hole all the way through the wood pieces that will make up the pendant. Step 3. Smooth down and sand the wood pieces. A sanding padworks fine for this step. Step 4. Paint or Stain wood turns. Step 5. Attach the fabric to the bottom of the drum shade to create a diffuser. Cut the fabric to the size of the drum shade. Using Velcro attach the fabric to the bottom of the shade. Although the Velcro came with an adhesive backing, I attached the Velcro to the shade using a hot glue gun. . Trim the excess fabric. . Step 6. Attach LED lights to the Paint Stirs and add batteries to the lights. Step 7. String up the lights. Step 8. Add wood turns to the rope at the top of the drum shade. Step 9. Create a loop hook for hanging the chandelier. Step 10. Install ceiling hook. Step 11. Hang and step back and marvel in what you have created. These LED lights come with a remote control that allows you to dim the lights and control it via timer. It’s pretty darn cool. This is the perfect lighting solution for renters who need something that can be easily removed and homeowners who are just not prepared to spend money on an electrician. I hope this inspires you to create a a DIY lighting feature in your home. LOVE LOVE LOVE this! What a creative idea…thinking where I can use this in my home. In some rooms would be great if you could set it to a timer.